If you look carefully, you’ll find those enchanting doors, fit for a mouse, all around the East Bay. 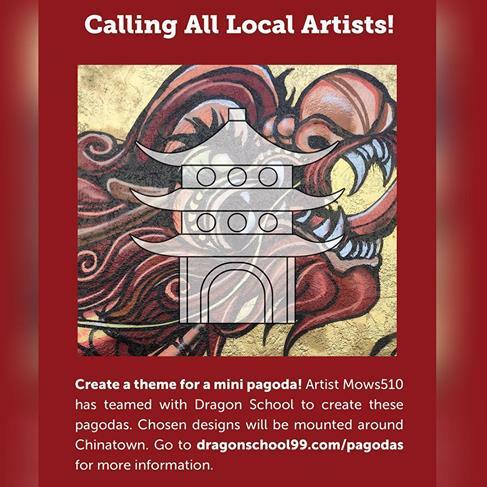 Conceived and driven by Alameda based street artistmows510, (please visit his Instagram to see more of his work) Mows510 was kind enough to donate 15 blank pagoda “mows” doors to Dragon School in order to promote artistic participation in Oakland’s Chinatown. Dragon School is extending the invitation to local artists to submit design ideas in finishing these 8” tall resin doorways. If your design is chosen, they will contact the 15 finalists of the date and time when and where their next Dragon School session will be to paint their Mows doorways. These doorways will be painted with brushes and non-toxic acrylic paint. The Dragon School session will last about two hours. The Dragon School team will be responsible for applying the creations to the walls in Chinatown. Identities of the chosen artists will remain anonymous. Only you and Dragon School will know which artist put up their mysterious and enchanting doorway. Please send questions and submit your theme to dragonschool99@gmail.com by November 21, 2016 to be considered. Applications will then be reviewed by the Dragon School team and be decided the following week.